The prettiest bedroom ever. 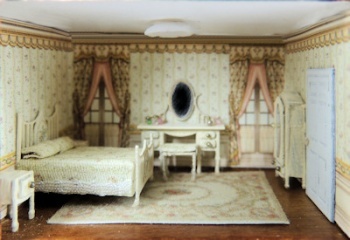 Inspired by Bespaqs wildflower bedroom set, this Edwardian era set includes bed with custom printed fabric cover, vanity and stool, nightstands and mirrored armoire. Wallpaper is also included. Please be aware that there is some variance in the room sizes of the baby houses. We have tried to scale the wallpaper so that it will work in all of the houses, but some variance as to exact window placement on back wall may occur.